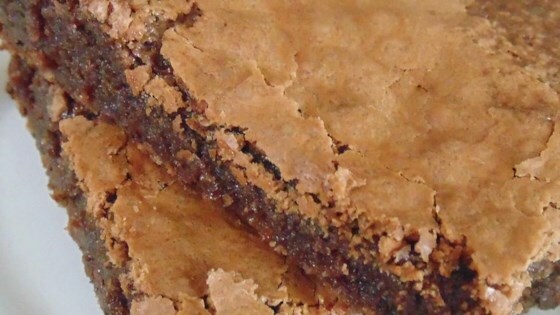 "These scratch-made brownies are simple and delicious." Preheat oven to 350 degrees F (175 degrees C). Lightly grease an 8-inch square baking pan. Melt butter and chocolate in top of a double boiler over simmering water, stirring frequently and scraping down the sides with a rubber spatula to avoid scorching. Remove top of double boiler and stir sugar, flour, eggs, salt, and vanilla extract into chocolate mixture until batter is smooth. Fold walnuts into batter; spread into the prepared pan. Bake in the preheated oven until a toothpick inserted in the center comes out clean, about 25 minutes. Cut brownies while warm. It was super easy to make! My family thought the brownies were delicious! This recipe is a keeper! This was a very simple recipe. They were super moist and super yummy! Delicious! I put a half cup of chopped walnuts only on the top because I wasn't sure if family would like it in the batter. Still good!